The tire pressure warning system warnsyou that the tire inflation pressure islow. The tire pressure warning system is nota substitute for checking normal tire inflationpressure. Check the tire inflationpressure with a tire pressure gauge regularly. The warning system may not activateimmediately if bursts or sudden airleakage should occur. The tire pressure warning light comes onwhen the “POWER” switch is selected in“IG−ON” mode and goes off after a fewseconds. This means the tire pressurewarning light is operating properly. If thetire inflation pressure becomes low, thelight comes on again. In this case, adjustingthe tire inflation pressure will turn offthe light after a few minutes. If the lightcomes on after blinking for 1 minute, thetire pressure warning system is not workingproperly. If the tire pressure warning lightcomes on, be sure to observe thefollowing precautions. Failure to doso could cause loss of vehicle controland result in death or serious injury. Stop your vehicle in a safe place assoon as possible. Adjust the tireinflation pressure immediately. If the tire pressure warning lightcomes on even after tire inflationpressure adjustment, it is probablethat you have a flat tire. Check thetires. If the tire is flat, change tothe spare tire and have the flat tirerepaired by the nearest Toyota dealer. Avoid abrupt maneuvering and braking.If the vehicle tires deteriorate,you could lose control of the steeringwheel or the brakes. The tire pressure warning light may turnon due to natural causes such as naturalair leaks or tire inflation pressure changescaused by temperature. In this case, adjustingthe tire inflation pressure will turnoff the light after a few minutes. Pushing the tire pressure warning resetswitch should not turn off the tire pressurewarning light. Adjusting the tire inflationpressure will turn off the light. The compact spare tire is not equippedwith the tire pressure warning valve andtransmitter. If a tire goes flat, the warninglight will not turn off even though the flattire is replaced with the spare tire. Replacethe spare tire with the repaired tireand adjust the proper tire inflation pressure.The tire pressure warning light will turnoff after a few minutes. As an added safety feature, your vehiclehas been equipped with a tirepressure monitoring system (TPMS–tire pressure warning system) that illuminatesa low tire pressure telltale(tire pressure warning light) when oneor more of your tires is significantlyunder−inflated. Accordingly, when thelow tire pressure telltale (tire pressurewarning light) illuminates, youshould stop and check your tires assoon as possible, and inflate them tothe proper pressure. Driving on a significantlyunder−inflated tire causesthe tire to overheat and can lead totire failure. Under−inflation also reducesfuel efficiency and tire treadlife, and may affect the vehicle’s handlingand stopping ability. Please note that the TPMS (tire pressurewarning system) is not a substitutefor proper tire maintenance, andit is the driver’s responsibility tomaintain correct tire pressure, even ifunder−inflation has not reached thelevel to trigger illumination of theTPMS low tire pressure telltale (tirepressure warning light). Do not use liquid sealants for a flattire as tire pressure warning valveand transmitter will be damaged. When the tires must be repaired orreplaced, have them repaired or replacedby the nearest Toyota dealeror an authorized tire dealer. Thetire pressure warning valves andtransmitters will be affected by theinstallation or removal of tires. If the tire pressure warning light comeson after blinking for 1 minute when the“POWER” switch is selected in “IG−ON”mode, the tire pressure warning systemis not working properly. If tires not equipped with tire pressurewarning valves and transmitters areused. If the ID code on the tire pressure warningvalves and transmitters is not registeredon the tire pressure warning ECU. If electronic devices or facilities usingsimilar radio wave frequencies arenearby. If a radio set at similar frequencies isin use in the vehicle. If a window tint that affects the radiowave signals is installed. If there is a lot of snow or ice on thevehicle, in particular around the wheelsor wheel housings. If non−genuine Toyota wheels are used. If the tire inflation pressure is morethan 500 kPa (5.1 kgf/cm2 or bar, 73psi) or higher. If the tire pressure warning light continuesto come on after blinking for 1 minutewhen the “POWER” switch is selected in“IG−ON” mode, have the system checkedby your Toyota dealer. Even if you use genuine wheels, the tirepressure warning system may not workproperly with some types of tires. Pushing the tire pressure warning resetswitch should not turn off the tire pressurewarning light. When replacing the tires and wheels, besure to install tire pressure warning valvesand transmitters. ID codes on the tirepressure warning valves and transmittersare registered on the tire pressure warningECU. When replacing a tire pressurewarning valve and transmitter, it is necessaryto register the ID code of tire pressurewarning valve and transmitter. Havethe ID code registered by your Toyotadealer. If the ID code is not registered, the systemwill not work properly. After about 1hour, the tire pressure warning lightcomes on after blinking for 1 minute toindicate a system malfunction. When the tires or tire pressure warningvalves and transmitters must bereplaced, have them replaced by yourToyota dealer. The tire pressure warningvalves and transmitters will beaffected by the installation or removalof tires. When initializing the system, the presenttire inflation pressure is stored as standard.The tire pressure warning systemdetermines decreased air pressure bycomparing the present and the standardtire inflation pressures. 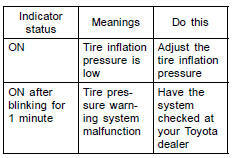 When you changethe set tire inflation pressure, it is necessaryto initialize the tire pressure warningsystem. When rotating the tires on vehicles differingwith front and rear tire inflationpressures. 1. Park the vehicle in a safe place andthe hybrid system is off. 3. Turn the “POWER” switch to “IG−ON”mode. 4. Push and hold the tire pressure warningreset switch until the tire pressurewarning light blinks slowly three times. 5. Wait for a few minutes with the “POWER”switch selected in “IG−ON” mode,and then turn the hybrid system off. If you push the tire pressure reset switchwhile the vehicle is moving, initialization isnot performed. If you push the tire pressure reset switchaccidentally and initialization is performed,adjust the tire inflation pressure to thespecified level and initialize the systemagain. If the tire pressure warning light does notblink slowly three times when you pushand hold the reset switch, initialization hasfailed and the tire pressure warning systemmay not work properly. In this case,initialize the system again. If initializationcannot be performed, have the systemchecked at your Toyota dealer. Do not push the reset switch withoutfirst adjusting the tire inflation pressureto the specified level. Otherwise,the tire pressure warning light maynot come on even if the tire inflationpressure is low, or it may come onwhen the tire inflation pressure is actuallynormal.